Ullsaard has conquered the known world. All have fallen before his armies. Now it's time to take the long journey home, back to the revered heart of the great Empire he had helped create for his distant masters. But when he returns to the capital, life there is so very different from what he had believed. Could it be that everything he has fought for, has conquered and killed for, has been a lie? Gav Thorpe works from Nottingham, England and has written more than a dozen novels and even more short stories. Growing up in a tedious town just north of London, he originally intended to be an illustrator but after acknowledging an inability to draw or paint he turned his hand to writing. Who would you have cast as narrator instead of Paul Thornley? If you could play editor, what scene or scenes would you have cut from The Crown of the Blood? All scenes in which the main character acts like an idiot. The man is supposed to be the best general of the Empire but he can barely see beyond the superficial. Hint for the author battlefield tactics do not vary that much from politics. If you wanted him to be ignorant he should have had a lower rank and only in the end come to power. Not good, not bad, missing character development. I could not find a character that i liked even the main. Not going buy another book in the series. Would you try another book written by Gav Thorpe or narrated by Paul Thornley? Would you listen to another book narrated by Paul Thornley? 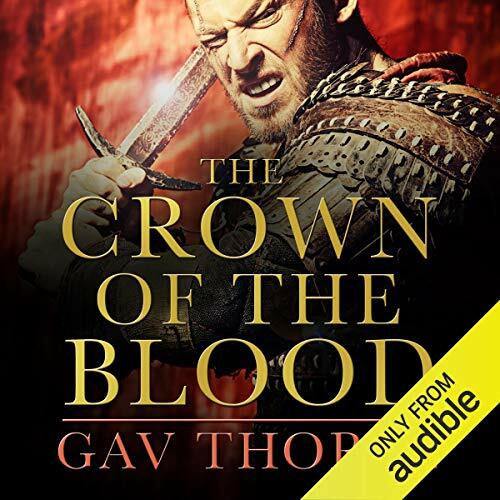 Do you think The Crown of the Blood needs a follow-up book? Why or why not?